Nearly all the recruiters we meet are saying that their primary challenge is attracting more candidates. 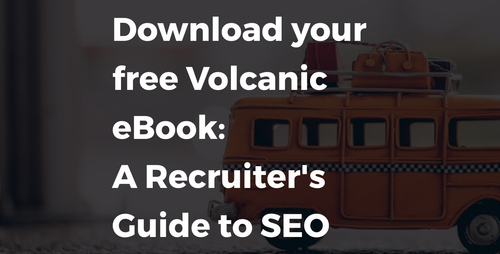 Volcanic have been at the forefront of this shift to more candidate driven strategies. One of the key elements is ensuring your website plays a central role in answering this challenge. We've delivered over 100 websites for recruiters and our experience proves that a well designed and structured website with relevant content will drive an increase in candidate traffic. This is the first step in the process of building a deeper candidate pool that will add value to your business. So, how have we done this? ? Typically over 50% of candidate traffic will be using a mobile or tablet to access your website. Therefore, if your current website does not work well for mobile devices then it will not only deliver a poor user experience, it will actually affect your search rankings. Whilst you may not be penalised, competitor websites that provide a better mobile experience will rank higher and attract more of the candidates you'll want to speak to! By designing your new website to work effectively for mobile you will see an increase in mobile traffic at the expense of your competitors. For example, a crucial element is how long it takes for your website to load onto a mobile device (load speed). Simple practices such as making sure video and imagery is optimised will ensure that load speed is minimised. Security is becoming a major issue for all types of business, particularly recruiters, where sensitive information is captured and transferred between systems. Some website platforms such as Wordpress are particularly vunerable to attack. We have built our own platform which is built with security in mind and ensures that data transfers are secure by using advanced encryption techniques. This enables us to provide SSL certification and ensures that your website and the data collected through it is secure. Google recognises this (you can see it as https on a URL) and rewards sites that have this in place. This is often overlooked as a way of attracting more traffic to your website. Developing and publishing high quality, relevant content on a regular basis, especially through blogs, will help improve and maintain your rankings and search related traffic. Having a content calendar in place will keep you disciplined and ensure your site is fresh, as well as providing a means of engagement with your candidates. Content should reflect the needs of your candidates - think about the types of content and information they will look for and reflect this throughout the website. Another neglected area is using the data you already have as a means to drive repeat visits. As well as attracting new visitors to the website, we let you use data gathered from previous visitors to drive intelligent ongoing communications. We do this by making it easy to send relevant job alerts and utilise our marketing automation tool to drive candidates back to your website. So what does this means for you - well, we often see a 20% increase in unique visitors following the launch of one of our websites. This is not just vanity traffic, but high quality potential candidates. This has a commercial value to your business, not only in terms of more potential candidates for your clients, but the data capture opportunities they present even if they don't apply for a specific job.